Partition walls are constructed to keep your hazmat chemical storage containment separated while keeping your chemical inventory protected. U.S. Chemical Storage offers extremely dependable and compliant partition walls for your chemical storage containment applications. Storing incompatible hazardous materials must not be taken lightly; with a partition wall your chemical storage containment will be managed and kept safe. We offer 2-hour fire rated, 4-hour fire rated and extremely strong solid mesh partition walls to separately store your chemical storage. Our solid partition wall is very dependable and offers superior strength and is constructed from heavy-duty steel for superior strength. The our bi-directional partition walls can secure your inventory with extremely strong hand-welded steel. Our bi-directional partition wall is constructed from UL Classified fire-resistive gypsum wallboard on each side of the structural steel studs and covered with galvanized steel sheets for ultimate fire rated protection. Manage your chemical storage safely with a partition wall from US Chemical Storage. Crane / Hoist for Drum movement creates an efficient process for moving chemical drums in spaces that are too tight to squeeze or too small to fit a forklift. The mechanical crane and hoist system facilitates the ease of transporting storing drum containers efficiently and effectively to minimize your manufacturing costs, while keeping your chemical storage containment maintained. Our crane and hoist system meets ASME/ANSI B30.16 and OSHA Standards. Constructed for heavy-duty chemical storage applications, and can withstand heavy chemical storage drums. 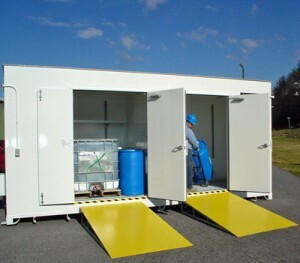 100% fully customizable for your unique chemical storage applications. Increase your production and keep your chemical drums containers organized with our crane and hoist system. US Chemical Storage offers a wide variety of parts and accessories to keep your operations running safe. Manager your chemical storage with a drum hoist system today.